A parliamentary report of 1776-7 recorded parish workhouses in operation at Honiton (for up to 60 inmates), Feniton (8), St Mary Ottery (100), Sidbury (40), and Sidmouth (20). Sidmouth's workhouse stood near the ford at the north end of Mill Street. Northleigh's establishment was located where the village's Old School House now stands. County of Devon:Cotleigh, Dunkeswell, Farway, Feniton, Gittisham, Harpford, Honiton (3), Luppitt, Monkton, Northleigh, Offwell, Up Ottery, Venn Ottery, Ottery St Mary (2), Payhembury, Plymtree, Salcombe Regis, Sheldon, Sidbury (2), Sidmouth (3), Southleigh, Talaton, Widworthy. Later Addition: Yarcombe (from 1894). The population falling within the Union at the 1831 census had been 22,330 with parishes ranging in size from Monkton (population 120) to Ottery St Mary (3,849) and Honiton itself (3,509). The average annual poor-rate expenditure for the period 1833-35 had been £10,244 or 9s.2d. per head of the population. Honiton entrance block from the north-east. In 1894, the British Medical Journal set up a "commission" to investigate conditions in provincial workhouses and their infirmaries. Following a visit to Honiton, the commission's report was broadly favourable but included a number of criticisms and recommendations. The low and narrow bedsteads in the sick wards were both uncomfortable for their occupants and increased the work of the nurses. There were no baths or bathrooms and any hot water required had to carried from the kitchen. The sole nurse, though long-serving, was neither trained nor a certified midwife. Further details are available in the full report. 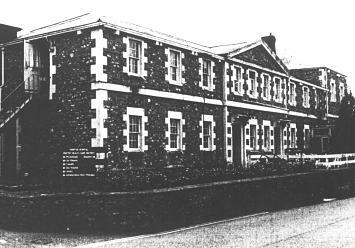 The former Honiton workhouse later became Marlpits Hospital. The workhouse buildings were demolished in 1995 and a new hospital has been built on the site. Devon Heritage Centre, Great Moor House, Bittern Road, Sowton Exeter EX2 7NL. Very few records survive. Holdings include: Guardians' minute books (1894-6, 1905-1932); Boarding-out committee register (1904-32).